The nutrients in the mash residue (after fermentation) are concentrated threefold. (This can be determined by weight ratio.) Yeast cells and metabolites formed during the fermentation also add to the highly nutritious and palatable feed ingredients. The product is called distiller's feeds, a mixture which is high in protein and rich in water-soluble vitamins and minerals. Because the fermentation process removes only starch, all the remaining digestible nutrients are left in the distiller's grain. In addition, some unidentified nutrients called GFF (grain fermentation factors) help to stimulate growth and rumen function in cattle. Distiller's grains are the solids that are separated from the spent stillage (removed prior to -- or right after -- fermentation). The solubles are the water-soluble nutrients and the fine solid particles that have escaped separation. 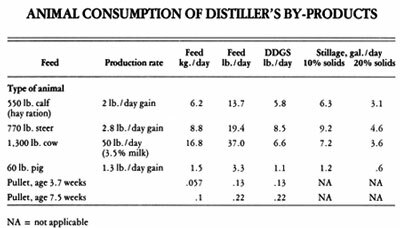 Source: Distiller's Feed Research Council, Cincinnati, Ohio. NOTE: The remaining percentages are composed of bulk (cellulose and other nitrogen-free extracts). Distiller's feeds should not be fed as a whole or complete ration. They should constitute no more than 30% (wet or dry) of the total when mixed with other feeds. Since each farmer has his own particular feed stocks, he should consult with the county livestock agent in his area to determine the best formulation for his particular livestock needs. Reprinted from Small Scale Alcohol Production, The United States Department of Agriculture, Washington, D.C. 20250. The by-product, stillage, from ethanol production is a thin slurry containing about 10% solids. Most distilleries dry this product and market it as distiller's dried grains with solubles (DDGS). The dried product is a well-known feed ingredient generally used by feed manufacturers. The weight of material which is transported consists mostly of water. Animals are limited in their ability to consume water. The wet product deteriorates rapidly and should be fed within one to two days to avoid large nutrient losses. The major advantage of using stillage is the elimination of the costs for the equipment and energy used to process DDGS. Dried grains can be transported economically over larger distances and are much simpler for feed manufacturers and farmers to handle. The price of distiller's dried grains with solubles will be less than the price of soybean meal because of its lower 27% protein content compared to 44 % for soybean meal. The price of DDGS will be determined by the prices of protein feeds such as soybean meal and energy feeds such as corn. The figure on the following page shows the relationship between the prices of DDGS, corn, and soybean meal at Chicago during the past 10 years. These price relationships would indicate relative prices if DDGS were sold as a feed ingredient on the wholesale feed ingredient market. The January 1979 Chicago price of DDGS was about $145 per ton. For use on farms, stillage would compete with other protein sources which the farmer might use. Few farmers can purchase and use bulk carloads of soybean meal or other protein ingredients. Farmers who purchase protein supplements from feed manufacturers pay about 50% above bulk wholesale soybean meal prices for the soybean meal component. For formulated rations, the wholesale price of soybean meal was increased by 50% above the Kansas City price to compare the value of stillage at the farm level. Liquid in the ration should not exceed four times the weight of the solids content. Feeds were formulated to use stillage as a protein source rather than a source of energy except for the heavier steer finishing ration where supplemental protein is ordinarily supplied by urea. When stillage is used in the rations of high production animals it must be available every day. The texture and taste of stillage rations is very distinct and animals would reduce their consumption with frequent formula changes. Small farm stills which produce stillage intermittently would have to restrict its use to low production animals, e.g., dry cows, or provide refrigeration or other means of preservation. Transportation costs will be high for stillage compared to other feeds because about 90% of a load is water. Transportation costs for feed delivery trucks are now about $1.00 per mile or $2.00 per mile on a round trip basis. A five-ton load of stillage would have a value of $84 when priced at $.07 per gallon. On this basis, if a truck delivered the stillage a distance of 42 miles, the transport costs would be equal to the value of the stillage. Similarly, a 20-ton load would have a maximum delivery distance of 168 miles, i.e. at a distance of 168 miles the value of the stillage would be zero. The two primary by-products obtained during the production of ethanol by fermentation of agricultural products are the residue, commonly utilized as an animal feed, and carbon dioxide. Distillery by-products from grain are a high quality ingredient for animal feed. Four products are commercially available and have been defined by the American Feed Control Officials. Distiller's Dried Solubles is obtained after the removal of ethyl alcohol by distillation from the yeast fermentation of a grain or a grain mixture by condensing the thin stillage fraction and drying it by methods employed in the grain distilling industry. The predominating grain must be declared as the first word in the name (Proposed 1963, Adopted 1964). Distiller's Dried Grains is obtained after the removal of ethyl alcohol by distillation from the yeast fermentation of a grain or a grain mixture by separating the resultant coarse grain fraction of the whole stillage and, drying it by methods employed in the grain distilling industry. The predominating grain shall be declared as the first word in the name (Proposed 1963, Adopted 1964). Distiller's Dried Grains with Solubles is the product obtained after the removal of ethyl alcohol by distillation from the yeast fermentation of a grain or a grain mixture by condensing and drying at least 3/4 of the solids of the resultant whole stillage by methods employed in the grain distilling industry. The predominating grain shall be declared as the first word in the name (Proposed 1963, Adopted 1964). Condensed Distiller's Solubles is obtained after the removal of ethyl alcohol by distillation from the yeast fermentation of a grain or a grain mixture by condensing the thin stillage fraction to a semi-solid. The predominating grain must be declared as the first word in the name (Proposed 1969, Adopted 1970). Because of the high energy requirements for drying products such as distiller's and brewer's by-products there have been continuing efforts to utilize undried products. Various brewers have marketed wet grains within reasonable distances of the brewery, primarily for feeding ruminants. The untreated distiller's by-product (stillage) has presented greater difficulties because of its higher liquid content; distiller's stillage is approximately 90% water compared to 70% water in brewer's wet grains. The reason for this difference is that brewers remove as much of the liquid as possible from the solid feedstock after enzyme treatment and this liquid (wort) is then fermented. Distillers simply distill the alcohol out of the fermented solid-liquid mixture. Distillers could remove the solids fraction from the stillage and sell a wet grain product, but a problem of disposing of the liquid would remain. Too, a significant loss of nutrients (particularly soluble protein) in the liquid fraction would occur. Microbial decomposition is prevented in dry products. Wet products decompose rapidly and must be fed within one to two days in warm weather. Some preservatives might be used to increase the allowable storage life, but insufficient research has been done to determine the types of preservatives and their overall economics. Refrigeration could be used to extend storage time, but operating costs would be high; however, refrigeration costs would be lower than drying costs. The transportation costs for marketing dry products are reduced by eliminating the transport cost for water. Feed manufacturers are usually better equipped to handle dry ingredients. Farmers are usually equipped to feed dry feeds rather than slurries. About 16 pounds of by-product (dry weight) are produced from each bushel of corn. About 6 pounds are realized per gallon of 200-proof alcohol. If the by-product is not dried but utilized as stillage, then the same equivalent solid materials will be produced. The concentration of solids in the stillage will depend upon the operation of the cooking and fermenting process. In normal operations, about 30 gallons of mash will be used per bushel of grain. After removal of the alcohol, there will be about 27 gallons (224 lb.) of stillage containing about 16 pounds of solids. The quantity will be reduced slightly if some of the liquid from the stillage is set back for use in a succeeding batch. The amount of liquid which may be set back has not been accurately determined but may be as much as 50% of the liquid. A stillage can probably be produced which will be more concentrated than the normal stillage. With maximum (50%) setback there would be 14 gallons (116 lb.) of stillage with 12% solids per bushel of corn. A large increase in fuel alcohol production would lead to a change in the supply of vegetable protein supplement available for animal feeds. A major increase in alcohol production, say to the point of utilizing one billion bushels of corn per year, would increase the DDGS supply from the present 450,000 tons per year to 8,000,000 tons per year. Obviously this would have a significant effect on the supply and price of vegetable protein supplements. However, this diversion of corn would be equivalent to about 10,000,000 acres of corn production at about average yields. Such a diversion of corn supplies could change the relative corn-soybean acreages to reduce soybean supplies, and overall protein supplies might not be affected greatly. An additional 8,000,000 tons of DDGS would represent a very significant increase in that supply but a much smaller percentage of increase in the overall supply. In spite of the advantages of dry products, stillage is probably the preferred form of disposing of by-products from small stills. The quantity of stillage should be small enough to allow it to be fed within a reasonable distance from the point of production. Since stillage feeding has not been widely practiced, there is limited research or documented use-data on which to base recommendations for feeding from either nutritional, animal performance, or technical (handling) standpoints. The Kentucky Agricultural Experiment Station (Wilford, 1944 and Garrigus, 1948) reported some research on stillage feeding during the 1940s. This research was directed toward maximum utilization of stillage rather than a most efficient use of its nutrient elements. In general, the Kentucky recommendations were that adult beef animals should be limited to 40 gallons of stillage per day and swine to 4 gallons per day. Beyond these limits, urinary and other animal problems arose. When stillage is fed at these levels, animals are being forced to consume water at an above normal level and protein, particularly, is supplied in excessive amounts. Reprinted from Small-Scale Fuel Alcohol Production. The United States Department of Agriculture, Washington, D. C. 20250. Stillage and wet grains must be used in a relatively short time to avoid excessive microbial decomposition. Little research has been reported, but a recent publication by Stechley, et al. (1979) reports on the effect of storage on brewer's yeast slurry. Slurry was stored at 4 deg, 21 deg, and 30 deg C for 35 days. Storage at 4 deg C showed small changes in chemical composition during the 5-week period. Storage at 21 deg C (70 deg F) showed significant changes in the first seven days; 15% of the dry matter was lost, and true protein dropped from about 30% to 20% (a 30% loss) on a dry matter basis. At 30 deg C the dry matter loss was about 16% and protein dropped from about 30 to 13%. Total crude protein increased slightly as dry matter decomposed, but the true protein was converted to ammoniacal form. The protein conversion would have little effect on ruminants, but it would be undesirable for monogastrics. 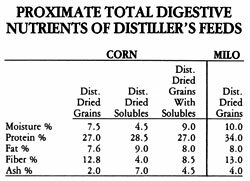 Miller (1969) evaluated the losses when distiller,'s wet grains were ensiled. Dry matter losses ranged from 11 to 21%, but the loss of soluble carbohydrates was high in relation to other lower value fractions such as fiber. Removal of spoiled material which should not be fed was difficult. The conclusion to be reached is that stillage and/or wet grains must be fed within one or two days to avoid significant nutrient loss or be given special treatment, probably refrigeration. Although this problem is not insurmountable, it will be a significant problem, particularly for the smaller farm-size still which may not distill a batch every day. Stillage or wet grains have a distinct odor and cannot be added to or removed from rations randomly without an adverse effect on feed consumption and animal performance. This will be a very important factor with dairy cattle. Also, with dairy cattle, the material may affect milk flavor; hence, it is probably best to feed just after, rather than shortly before, milking. stillage which is probably the only practical form for disposing of by-products from farm stills. wet grains from medium-sized operations. condensed solubles from medium-sized or large operations. distiller's dried grains or distiller's dried grains with solubles from medium-sized or large operations. Stillage will produce rations of unique physical form, odor, and palatability. High production animals must be kept constantly on such rations to maintain the feed consumption levels required. Frequent interruption of supply would drastically reduce the value of the stillage; consequently, if frequent interruptions occur, perhaps due to shutdown for maintenance, then it might be necessary to maintain refrigerated supplies for emergency use. 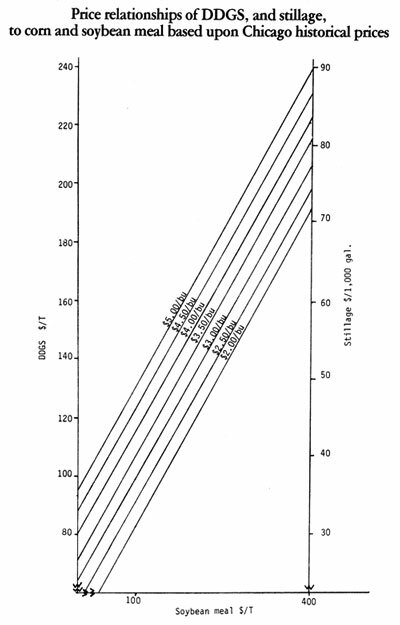 Rapid loss of nutrients due to microbial action will require that stillage holding time be limited; it should be fed within 24 hours during summer months. Handling and feeding stillage during very cold weather will present some new and unique problems because of freezing. It will be necessary to feed twice a day under many conditions where feed bunks are located outside in Northern regions. Feed bunks will have to be capable of holding feeds containing large amounts of liquid. Concrete bunks would probably be adequate with some sealing at joints. The dry feed could be placed in the trough and then the stillage placed on top. It may be possible to mix roughage and stillage in the normal mixer-feeder wagons. Slurry feeding equipment has been developed for swine feeding in Europe and should be available with little modification. Stillage and wet distiller's grains have not been defined by the American Feed Control Officials. This will be necessary before they can be widely marketed. One potential use of condensed solubles was considered but not investigated. Liquid feed supplements for beef are becoming increasingly popular. Usually they are molasses-urea mixtures, but some natural protein would be preferred by many nutritionists. Some feed manufacturers are using large quantities of condensed solubles in their liquid feed formulations. The foregoing discussion focused on grain distiller's by-products. Although certain characteristics of the by-products produced from other feedstock differ, the analysis of their utilization would be analogous. Distinct properties of potato and sugar crop by-products are delineated below. The by-product of potatoes should contain a higher ash content by a factor of at least 5 compared to that of corn distiller's grains. The protein content should be slightly less and the fiber content about equal to those for corn distiller's grains. Amino acid data are not readily available. B-vitamin composition should be about the same since this originates from the yeast. Because of the lower protein, the material would have a lower value than DDGS. Sugar beet pulp is a well-defined commercial feed ingredient which is presently priced in Chicago at $130 per ton compared to $145 per ton for distiller's dried grains. If the solubles were condensed, the price should be about the same as for brewer's dried yeast which is now priced at about $400 per ton in Chicago; hence, the overall value of these by-products should be greater than that for grain by-products. The plant residue from sugar manufacture (bagasse) is of relatively low value; some is used for the manufacture of building board but most is used for boiler fuel. Its yeast residue could be recovered and should have the same value as other dried yeast. The plant residue may have a slightly higher feeding value than sugar cane but no nutritional data have been found. The yeast by-product would be valuable. Carbon dioxide is produced in about equal weights with alcohol during the fermentation process. One pound of carbon dioxide has a volume of 8.1 cubic feet. A million-gallon-per-year still would -- therefore -- produce approximately 21,000 pounds of carbon dioxide per day, having a volume of 170,000 cubic feet. The gas from the fermenters would be relatively pure carbon dioxide (and water vapor) if the fermenters were relatively tight and would be suitable for many uses. Keeping a slight positive pressure inside the fermenter would exclude air.